Welcome to today’s episode of E-Motion Health featuring Dr Demartini, Human Behavior Specialist and internationally published author. 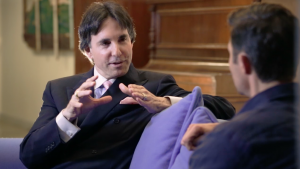 In this 10 minute episode, Dr Demartini explores his E-Motion modality ‘The Demartini Method’ a technique transforming perceptions and allowing you to become master of your destiny, not a victim of your history. Discussing health, wealth, vitality and youth, Dr Demartini explains his secrets for inspiration and generating enthusiasm for life. Dr Demartini believes when you carry around a thought, belief or story that carries a charge you generate ‘brain noise’ and hinder your own self worth. His technique involves a series of questions which enables you to re-frame the past in the light of thanks. Find out more in the episode below. His trademarked methodologies, the Demartini Method and the Demartini Value Determination, are the culmination of 42 years of cross-disciplinary research and study. His work has been incorporated into human development industries across the world. He is the author of 40 books published in over 29 different languages. He has produced over 60 CDs and DVDs covering subjects such as development in relationships, wealth, education and business. Each program is designed to assist people to activate leadership and empower themselves in all seven areas of their lives: Financial, physical, mental, vocational, spiritual, family and social. Find out more on Dr Demartini’s website. Awesome! It is beautiful to see how regardless of the approach (science, religion…) the answer is always the same, we all are One. We are connected and once we are able to “perceive” this one and only reality our lives change for the better. We see ourselves in everything, so we don’t judge, we just Love. So true Helena! We love to share different techniques because there is no one-size fits all approach. Some Experts resonate more with one person or one situation – but they are all centered in LOVE. Thanks so much for your comment. When moving from yes it did happen, to forgiveness and understanding – then this *is* a change in perception. So I think we are all talking about the same thing.